My mom told me that a LEGO exhibit was at a museum near us and we might want to check into it. 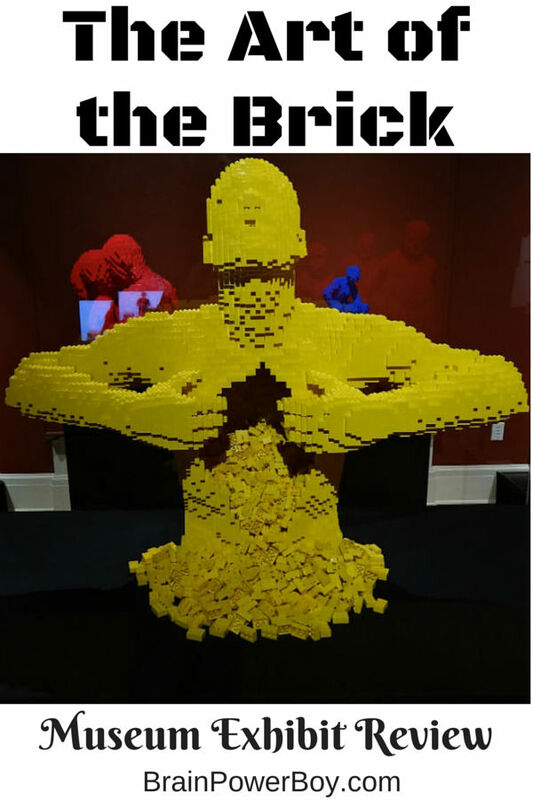 It turned out that the exhibit was none other than The Art of the Brick! I was super excited and couldn’t wait to learn more. 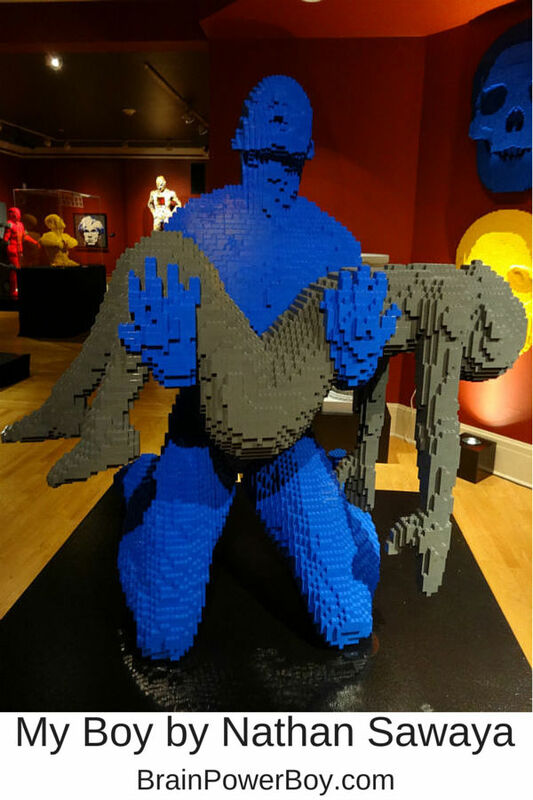 I had the opportunity to interview Nathan Sawaya who is the Artist in LEGO Bricks behind this exhibit which made me all the more interested in going. I planned a surprise day for my son and off we went. He had no idea where we were going which is always rather exciting. We drove to the museum and he was surprised to find out that there was a LEGO exhibit there. What a day we had! We enjoyed the exhibit, went to lunch, stopped at the large library in that community and got 4 bags full of books, and ended with a visit to a little cafe for a treat. I love taking him out for surprise days. This is a wonderful exhibit. If you have a chance to go, even if it means you have to drive for a while, I highly suggest you make it happen. When we first walked in we were able to see a video of an interview with Nathan Sawaya. It was very nicely done. I had interviewed him myself so I was even more interested to see what he had to say about his work. Our museum is rather small so we didn’t get to view all of the pieces that are sometimes exhibited in The Art of the Brick, such as when it was showing in New York, but there were a 33 pieces on display so we were happy about that. Seeing Yellow (above) in person was worth the price of admission. Yellow is perhaps Nathan’s most famous piece and we have seen it in books and on the Internet many times. It was quite the experience to stand in front of the case and be able to walk all around it and view each tiny detail. Take a look at the pictures for an idea of what we were able to see. We enjoyed getting a close up view of how the items were made. Most of the pieces were sculptures but they did have a few mosaics too. I was very excited about this as I am a big fan of LEGO mosaics. One interesting story from our visit was that when we were viewing My Boy, a young boy of perhaps 3-years-old walked up with a friend and their moms. He stood in front of the sculpture, glanced up and said “Oh, a dead boy.” He was just stating a fact, he was not upset or anything. His mother then said “No, the boy is just resting, he isn’t dead.” How odd it was that this young child was so perceptive as to have realized that it was indeed a sculpture about death and that his mother told him he was wrong. I suppose she was trying to protect him (or perhaps herself) from the reality of the piece. This was rather upsetting to both my son and I. He was upset that the mother lied to the boy. We had a good conversation about it afterwards. My Boy was so compelling that I couldn’t speak when I saw it. It is very touching. 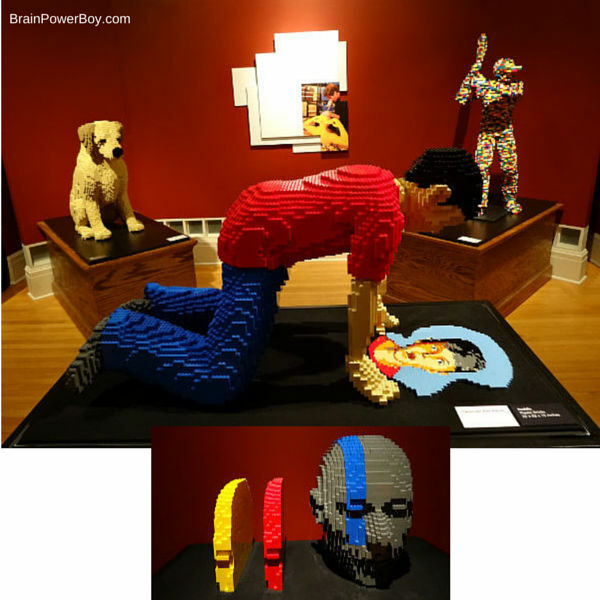 Who knew a sculpture made of LEGO could have that sort of impact on the people viewing it. We continued through the exhibit to see many amazing pieces. We ended up spending a few hours at the museum with the lion’s share spent in The Art of the Brick. We both agreed it may be a once in a lifetime experience and really wanted to soak it all in. We were thrilled to see Yellow and the other LEGO pieces. My Boy had a big impact on both of us. It was a wonderful–especially for two LEGO fans and we won’t soon forget our special day together. Stay tuned for our book review on The Art of the Brick. Wow. I’ve seen Lego creations before – but we’re talking Legoland – the art /sculpture is amazing! If we ever get a chance to see it in person I definitely will take advantage! Oh and the point about The Boy is really interesting. I’m not sure how I would have reacted with a child that young – although the fact that he was so matter of fact about it I would probably just agree and move on. Maybe the mom really didn’t know? They do say that everyone perceives art in different ways. It really was amazing Erin. If you get a chance to see it, you should try to go. These sculptures are amazing! Thanks for linking up at the Thoughtful Spot Weekly Blog Hop! We hope you join us again next week! They really are Samantha. I hope you have a chance to see them in person.